Collection of Motion: Waterfalls (Cascade) comprises up to twenty unique, digitally simulated loops of waterfalls based on real-world falls. Every detail of waterfalls; their speed, volume, light and reflections have been generated to create motion that bears an uncanny near-realism to natural, ephemeral waterfalls. These visual simulations are distinct in that they do not flow continuously but repeatedly start and end, capturing the idealised form of a waterfall, a dreamlike spectacle that is rarely witnessed. 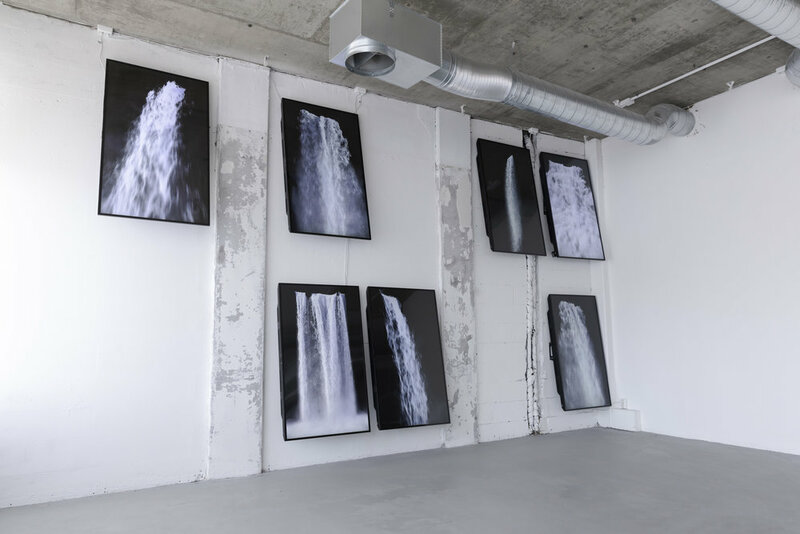 By creating and presenting a multiplicity of waterfalls alongside one another, and establishing relationships among them, Collection of Motion: Waterfalls explores what it is that makes a waterfall a waterfall and the attempt of the mind to grasp at the very nature of a thing. Accompanied by the audio of thundering water, Waterfalls (Cascade) is a powerful and immersive large-scale installation, that retains a natural meditativeness despite its digital production process.